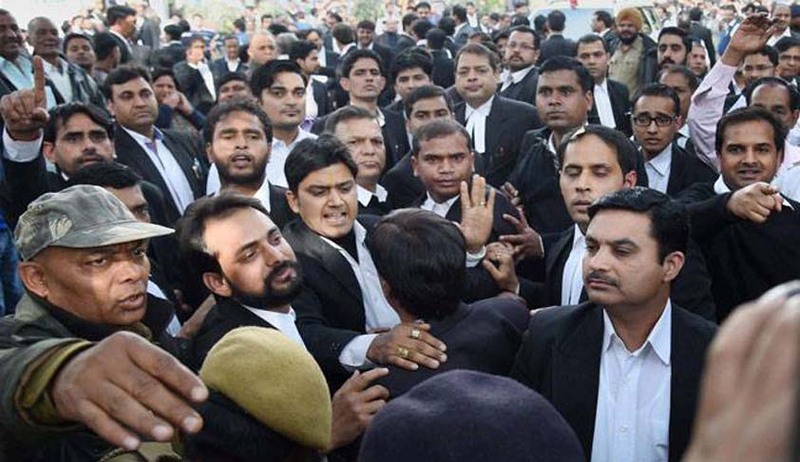 The Supreme Court today strongly condemned the incident where journalists covering the JNU row case, students and teachers were thrashed at the Patiala House court by goons and allegedly by some lawyers on Monday. A bench headed by Justice J Chelameshwar observed that "moderation seemed to be a forgotten word in todays society which was a dangerous trend. We are not taking any sides or going into merits but atmosphere in and around a courtroom cannot be vitiated like this. This is a matter of concern as this phenomenon is increasingly being seen in sensational cases". Acting on a petition filed by N D Jaiprakash, a JNU alumni seeking a free and fair trial to JNUSU President Kanhaiya Kumar and protection to him when he will be produced in Patiala house today, at 2PM the court imposed strict entry restrictions within the courtroom and court premises to ensure that Monday's violent incidents are not repeated. Only two relatives of accused can be allowed entry. If there are no relatives one faculty member and a studebt be allowed. Only 5 journalists be allowed entry inside courtroom. 25 journalists shall remain outside 10 metres away from court. Delhi police given liberty to act in accordance with law to maintain law and order and deal with violations. Lawyers like K T S Tulsi, Prashant Bhushan and Rajeev Dhawan appeared in the high voltage hearing which also witnessed commotion when a lawyer Rajiv Yadav shouted "Vande Mataram" inside the courtroom after which the bench sought an unconditional apology from him. KTS Tulsi the senior lawyer who appeared for the petitioner said violence in the court compound was totally unacceptable and it was shocking that even peoples representatives were involved in violence. When Tulsi blamed the police of inaction justice Chelameswar snapped back saying "it is easy to blame the police..if police does something it is called excesses and if they dont do anyrhing you complain." Tulsi also condemned attack on mediapersons saying they were doing their constitutional duty. Bhushan slammed the police saying it was a case where a group of lawyers who were identifiable on TV admitted they had attacked people whom they felt were "anti-national" and also an MLA was involved. But the police had not arrested them. Kumar's two days of extended police remand was expiring today and he will again be produced before the Metropolitan Magistrate at Patiala House court complex. Bhushan alleged that police were a mute spectator to this brazen display of violence and brute force being perpetrated on innocent persons who had gathered in the Court premises. “The surcharged and vicious atmosphere in the Court premises would come in the way of the fundamental right of the accused for a fair trial”, he said. Tulsi urged the apex court that neccessary directions have to be passed to the Centre and Delhi Police as a congenial atmosphere was imperative for a fair and impartial judicial proceeding, which is a fundamental right of every person under Article 21 of the Constitution. The petitioner has sought directions for the Ministry of Home Affairs and the police to ensure that the proceedings against Kanhaiya Kumar at the court of Metropolitan Magistrate Loveleen, is carried out in a manner which is not prejudicial to the fundamental rights of the persons. Giving details of the violence in which JNU teachers, students and journalists, including some female mediapersons, were roughed up by advocates and a politician, the petition said there was a need to ensure that no physical harm or any form of intimidation or disturbance is caused to the accused or any person attending the court in connection with the proceedings. It has been urged that proper and appropriate action is taken against any person who is obstructing the proceedings against Kanhaiya Kumar before the trial court in any manner. The petitioner has sought the safeguarding of the CCTV footage in and around the Metropolitan Magistrate's court, which may be used as evidence in any further proceedings in the matter. It is submitted that violence in the court complex can never be permitted or countenanced. It is so serious a breach so as to tantamount to criminal contempt of court and denial of access to justice.